What is a Soil Amendment? 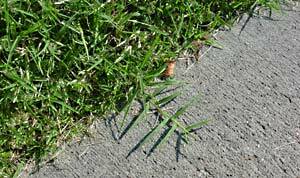 St. Augustine grass, despite its coarse leaves is favored in warm, humid climates for its ability to tolerate shade and salt. Photo by Dr. Van Cline, Agronomist, The Toro Company. Easily grown from sod, plugs, or sprigs, St. Augustinegrass produces a dense blue-green turf that has good shade and salt tolerance. It is highly popular in coastal areas from Florida to California. Drawbacks: Thick thatch if heavily fertilized and watered. Vulnerable to chinch bugs and grubs. Recommendations: For USDA Hardiness Zones 8 to 10. According to the National Turfgrass Evaluation Program (NTEP), look for slow-growing Amerishade, cold and shade-tolerant Classic, and chinch bug-resistant Floratam. Zoysiagrass provides one of the most uniform and dense lawns possible, but it has a straw-like appearance in winter. Photo by Dr. Van Cline, Agronomist, The Toro Company. Popular in the transitional zone and the South, Zoysiagrass is a thick, slow-growing turf. Although it may take two years to establish, you will end up with a lawn that weeds can rarely penetrate. Deep-rooted and fibrous, it does not mind heat or drought, although it does need an occasional watering. Zoysiagrass has a fine-to-medium texture; color varies by cultivar, is winter hardy, and is not particular about soil. Zoysiagrass also copes well with salt spray, pests, diseases, and some shade. Drawbacks: Straw color in the fall. High maintenance—prone to thatch, difficult to mow, poor recuperative powers, and high fertility needs. Recommendations: For USDA Hardiness Zones 6 to 9. Zoysia japonica, also known as Japanese lawn grass, has coarse, light green leaves, and is the best choice for colder climates. Zoysia matrella, also called Manilagrass, is a less winter-hardy, slower-growing species that creates a denser, finer lawn. Zorro and Emerald are top-ranked cultivars according to National Turfgrass Evaluation Program (NTEP) tests. 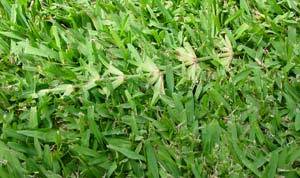 Bermudagrass is good for sunny southern lawns that receive heavy use, but it is invasive and requires edging. Photo by Dr. Van Cline, Agronomist, The Toro Company. One of the most widely used southern grasses; Bermudagrass thrives on numerous soil types, even salty soils. With a deep root system, it takes sun, heat, and dry conditions in stride, and forms a strong, erosion-resistant sod. Having both rhizomes and stolons, Bermudagrass quickly fills in damaged areas with its fine, low growth. New hybrids, some growing from seed, show improved color, texture, disease resistance, and cold tolerance. They cost less to maintain and establish quickly. Drawbacks: Straw-like brown after a frost, making it a candidate for winter overseeding. Bermudagrass also requires edging to prevent invasive growth; it forms thatch, and generally requires intensive management. It is the least shade-tolerant of the southern grasses. Recommendations: For USDA Hardiness Zones 7 to 10. Look for improved cultivars, such as Tifsport, Tifway, Aussie Green, Celebration, Premier, and Patriot. If frost is a worry, Tifsport, Tifway, and Ashmore are the most tolerant. Grows in both full sun and partial shade areas, this apple green grass prefers well-drained acidic soils and can be grown from seed. Known for its slow rate of growth, it requires less mowing. It spreads by stolons, forming a moderately dense low-growth turf of medium-textured grass. Drawbacks: Does not bear up well under heavy use. Salt spray also poses problems, as does a lack of iron, which leads to yellowing. To prevent heavy thatch development and large brown dead patches avoid using excess amounts of fertilizer. Recommendations: For USDA Hardiness Zones 7 to 8. Cultivars with better cold tolerance include Oklawn and Centennial. An up-and-comer for low-maintenance home lawns, Bahiagrass grows from seed in an open growth habit to form an apple green lawn. Bahriagrass started as a pasture grass on infertile, sandy soils, so it has a prolific root system to withstand drought. 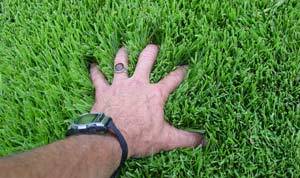 It also forms a durable wear-resistant sod, and is relatively pest-free. Drawbacks: Coarse texture makes it tough to mow. Not everyone likes the look of the tall seed heads and light green color. It may yellow from lack of iron, grows poorly in alkaline soils and areas with salt spray. Recommendations: For USDA Hardiness Zones 7 to 10. Avoid common Bahiagrass, use the preferred cultivars: Argentine, Tifton 9, and Pensacola. Carpetgrass will grow where few others can, including shade and bog. Similar to Centipedegrass, with its apple-green color and medium-wide blades, Carpetgrass spreads by creeping stolons, and can be grown from seed. Not high-quality, but Carpetgrass does provide an alternative for boggy sites in warm climates. Drawbacks: With shallow roots and no rhizomes, Carpetgrass needs watering when dry and does not stand up to wear. It is also quick to turn brown in the fall and slow to turn green in the spring. Recommendations: For USDA Hardiness Zones 8 to 9. No named varieties are available, so look for the species Axonopus Affinis.